AMMONNEWS - The General Secretary of the Middle East Council of Churches (MECC), Fr. 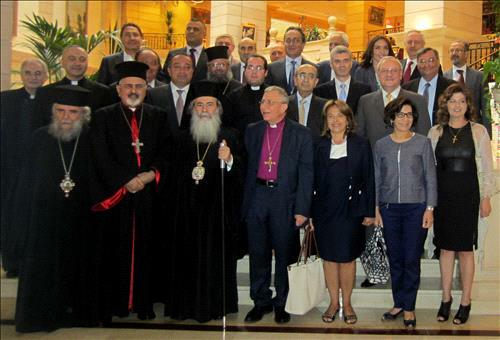 Michel Jalakh, called the Presidents of the Council to an extraordinary meeting in Amman, Jordan, on June 19th, 2014, which was hosted by His Beatitude Theophilos III. The Presidents were mindful of the commitment of His Majesty King Abdullah II to advocating for the Christian presence in the Kingdom, and were grateful for his continued support. In attendance were His Beatitude Theophilos III, Patriarch of Jerusalem, President of the Eastern Orthodox family, His Beatitude Ignatius Youssef III Younan, Patriarch of Antioch for Syriac Catholic Church, President of the Catholic family, His Grace Munib Younan, Bishop of the Evangelical Lutheran Church in Jordan and the Holy Land, President of the Evangelical family, and His Holiness Aram I, Catholicos of the Holy See of Cilicia of the Armenian Apostolic Church, President of the Oriental Orthodox family, represented by the co-Presidents. Pastor Dr. Habib Badr, President of the National Evangelical Church of Beirut and Honorary Treasurer of MECC attended also the meeting. The current unexpected events taking place in Iraq join a further deterioration within countries in the region, and the Presidents share in the suffering of these tragic events along with the innocent victims of hatred and violence. The people of Iraq are at risk of being dominated by political and religious extremism, a fact that calls upon us and the whole world to raise awareness and take immediate measures. The Presidents of the Middle East Council of Churches condemn all forms of violence against churches, mosques and other religious institutions. They encourage all Christians and people of goodwill to stand strong and not be afraid and to remember that they, together with their Muslim brothers and sisters, are the children of the same land and all share a common human nature and destiny. Therefore, we must respect and support one another as brothers and sisters. The Presidents stand in compassion and prayer for all those in exile, displaced in Syria and in neighboring countries. We call upon all concerned parties to seek reconciliation without racial or religious discrimination. We call to release the two kidnapped archbishops Boulos Yaziji and Yuhanna Ibrahim, in addition to all kidnapped priests and innocent people. Furthermore, the Presidents of MECC, comprised of the Eastern Orthodox, Oriental Orthodox, Evangelical, and Catholic families, call upon peacemakers in the entire international community, to defend the dignity and rights of all humans as well as freedom of religious expression, to quickly and effectively interfere in order to help our people to be liberated from the dreadful spiral of hatred and violence. We strongly condemn all forms of violence, regardless of who is the perpetrator, while simultaneously praying for peace, justice and reconciliation. We extend these prayers all over the world, but especially for all people of the Holy Land, to pursue peace, so that Jerusalem may be a beacon of peace throughout the world. We, the Presidents of the MECC, ask the Holy Spirit to guide our churches in the bond of love in Jesus Christ, our Lord.